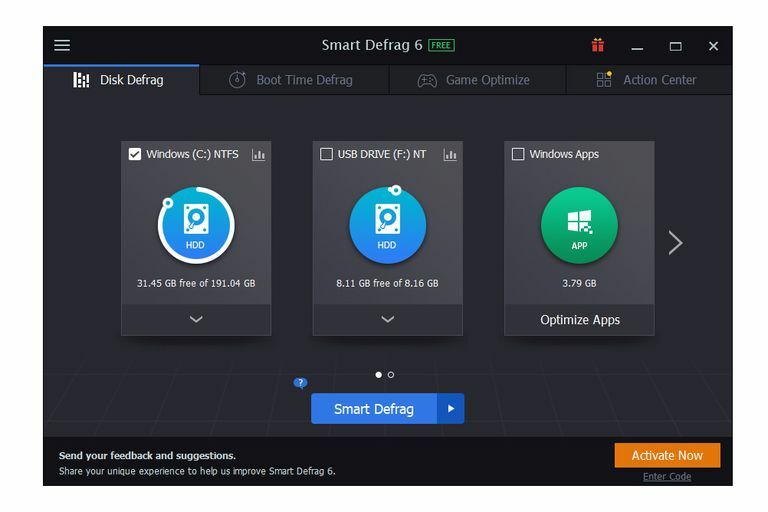 Smart Defrag is a free defrag program that intelligently determines the best time to defrag your PC. You can setup Smart Defrag to continually defragment your computer throughout the day, and even do so while it's rebooting. This review is of Smart Defrag version 6.2.0.138. Please let me know if there's a newer version I need to review. Smart Defrag has some unique features you may not find in other free defrag software. Under normal conditions, particular files in Windows are locked. You're unable to move these files because they're constantly being used. This causes a problem when you want to defrag those files, so Smart Defrag has an option to defrag the locked files. The way this works is you setup Smart Defrag to defragment the locked files when Windows isn't in use. The only time Windows isn't using the locked files is during a reboot, so Smart Defrag must run this type of defrag while your computer is rebooting. It's from the "Boot Time Defrag" tab of Smart Defrag that you can enable this option. This is where you'll find the options for a boot time defrag. Choose to enable boot time to defrag and then select any of the hard drives you have connected. The boot time defrag can be configured for the next reboot only, the first boot of every day, on every reboot, or the first boot on a specific day like every 7 days, 10 days, etc. Next, just add the files that you want Smart Defrag to defrag during a reboot. This is done in the "Specify files" section. There are also preset areas like page files and hibernation files, Master File Table, and system files. Unlike Defraggler, you can actually choose to defragment some or all of these areas, which is nice if you wish to speed up the overall process by just defragging the page file and hibernation file, for example. Disk Cleanup is an area in Smart Defrag's program settings that you may miss if you're not looking for it. It lets you define portions of Windows that get scanned for junk files. You can have Smart Defrag clear out these files so it's not defragmenting them, which may make a defrag last longer than is necessary. When you run a manual defrag, you can have these junk areas cleaned up. Some of the areas included in the scan are the Recycle Bin, Internet Explorer temporary files, clipboard, old prefetch data, memory dumps, and chkdsk file fragments. There's even an extra setting to enable secure file deletion using DoD 5220.22-M, one of the most popular data sanitization methods. To run a disk cleanup with Smart Defrag, use the dropdown menu below the specific drive that should be cleaned, and select Disk Cleanup. Now when you run a defrag the hard drives you selected to be cleaned will run through that process first before starting the defrag. Smart Defrag is one of the best free defrag programs. You can install it and completely forget about it. It can be setup to constantly run in the background and automatically adjust its actions depending on what you're doing. I really like that you can do a system cleanup during a disk analysis to clean up junk files that you no longer need. Smart Defrag cleans more areas than all the other defrag programs I've used. However, it doesn't do it automatically. If the program could auto-clean the files before every defrag, there'd be little to complain about. At the top of the program, under the disk drives, there's an option to add a file or folder to the list. You can include common files and folders that you wish to defrag on a regular basis. Also, when you right-click a file or folder in Windows and choose to defrag it with Smart Defrag, the data shows up on this list. I really like this feature. It's a simple way to track things you may know are always fragmented and have direct access to defragment them. I'm glad Smart Defrag has an exclude list in the settings. If you have data you don't mind contains fragments, then adding them there will exclude them from both an analysis and a defrag. Also, in the settings, you can choose to skip files that are over a particular file size, which is nice if you have many large files that would normally extend a defrag time if included. Not all defrag programs support boot time scans, so the fact that Smart Defrag does just adds to its awesomeness. Something I'm not a fan of in any program is when the installer tries to get you to install additional software. Smart Defrag might try to install a toolbar during setup, but you can easily dismiss it by choosing No, thanks, Decline, or Skip. When on the download page, be sure to choose the "External mirror 1" link and not the red one that's for purchasing Smart Defrag PRO.